Q: We know that for some time, several western countries have been finding faults with China on Xinjiang-related issues. But last weekend, in Abu Dhabi, the 46th session of the Council of Foreign Minister of the Organization of Islamic Cooperation (OIC) adopted a resolution which commends China's efforts for the Muslims. What is your comment? A: The resolution adopted by the 46th session of OIC Council of Foreign Ministers in Abu Dhabi on March 2 speaks highly of and fully recognizes the efforts China has made for Chinese Muslims and expressed its willingness to strengthen cooperation with China. The Chinese side appreciates that very much. Not long ago, an OIC delegation visited Xinjiang when they were in China for a political consultation. They saw for themselves that local Muslims live a happy life with good employment and full freedom of religion. 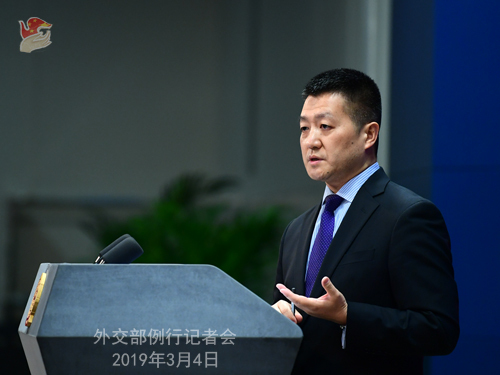 They spoke highly of China's ethnic and religious policies and recognized China's efforts for preventive counter-terrorism and de-extremization. In fact, China enjoys traditional friendship with Islamic countries and has close communication and exchanges with the OIC. Under the current circumstances, China stands ready to work with the OIC to strengthen mutually beneficial cooperation with the OIC and the Islamic world and forge the relationship into a model for cultural exchanges and South-South Cooperation. Q: Pakistani media have been reporting that according to Pakistani Foreign Minister Shah Mehmood Qureshi, a special envoy from China will be visiting both Pakistan and India to help defuse tensions between the two countries. Does China have any comment? There are also reports that Russian Foreign Minister Sergey Lavrov has proposed that the Shanghai Cooperation Organization (SCO) mechanism can be a forum where this issue can be discussed. Would you agree with the Russian view? A: On your first question, we have said many times that we hope that India and Pakistan, as two important countries in South Asia, will enjoy good neighborliness and friendship and resolve their issues through friendly consultations. I have said that in order to alleviate recent tensions between India and Pakistan, China is in close communication with both to facilitate reconciliation and dialogue. China will continue to play a constructive role in its own way in whatever that will help ease the situation and promote regional peace and stability. As for your second question, I have seen relevant reports that Russian Foreign Minister Sergey Lavrov proposed to do something under the SCO mechanism. Our principled position is that we encourage all constructive efforts towards easing tensions and promoting peace and stability in the region by relevant parties of the international community. Q: According to media reports, last week China and the US held a handover ceremony in the US where the latter returned 361 pieces of seized antiquities lost from China. Some online comments are calling the US handover a goodwill gesture. Does China have any comment? A: Given that the comments are about the consideration of the US side, I would suggest you seek verification with them. As to the handover of 361 pieces of lost Chinese antiquities in Indianapolis, we have expressed our appreciation. It was the third and largest such handover since the two sides signed an inter-governmental MOU on import restrictions of Chinese antiquities. I said earlier that enhancing cooperation in preserving antiquities in itself is an important component of people-to-people and cultural exchanges between China and the US. It goes without saying that we think it is a positive move on the US side to return the antiquities. On whether this is a goodwill gesture on the part of the US side under current circumstances, I would like to repeat our long-held view that China and the US, as two major countries, are bound to have some differences and encounter some difficulties or even contradictions. However, looking back on the past four decades of bilateral relations, we can see that despite the difficulties and differences, there has been more and more cooperation and exchanges. That is a natural result of the highly intertwined nature of the two sides' interests today. So we encourage all measures conducive to promoting shared interests and bringing the two sides closer. Q: The defense team of Ms. Meng Wanzhou of Huawei has filed a lawsuit against the Canadian government and police, saying that she was detained without cause at the airport for three hours, which violated her constitutional rights. Does China support Meng's lawsuit against the Canadian side? A: I'd refer you to Huawei for the legal actions the company and Meng Wanzhou have taken. The Chinese government's position on the Meng Wanzhou case is clear-cut. 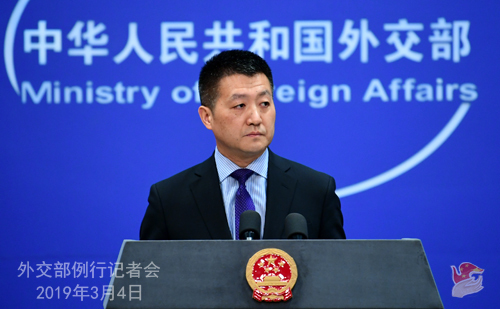 The US and Canada abused their bilateral extradition treaty and took compulsory measures on a Chinese citizen. This is a grave violation of her legitimate rights and interests and also constitutes a serious political incident. We once again urge the US to withdraw its arrest warrant and extradition request for Ms. Meng. We urge Canada to change course before going further down the wrong path and release Ms. Meng immediately, ensuring her safe return to China and legitimate rights and interests. Follow-up: Isn't it something of double-standard for Meng to be able to sue the Canadian government when Canadians Michael Spavor and Michael Kovrig have not even been granted access to lawyers? A: Regarding the cases of the two Canadian citizens you brought up, as I recall, my colleagues and I have made clear that China has strictly fulfilled our due obligations as required in the China-Canada Consular Agreement. Also I believe you know that relevant Chinese authorities took compulsory measures against the two Canadian citizens, Michael Kovrig and Michael Spavor, on the ground that they were suspected of involving in activities undermining China's national security. I believe you are well aware that it is common practice for all countries in the world to deal with cases concerning national security in this way. Follow-up: Can you confirm or not that these two Canadians have had access to lawyers? A: As I said, China has made necessary consular notifications to the Canadian side and fulfilled our due obligations as required in the China-Canada Consular Agreement. Q: Is China ready to play a mediation role between India and Pakistan? Russian Foreign Minister Sergey Lavrov says Russia is ready. I was wondering if China is also ready to do this? A: Regarding the relevant remarks from the Russian side, as I said earlier, we welcome all positive measures towards easing tensions and promoting regional peace and stability. In fact, China has been in close contact with both India and Pakistan and making efforts to promote peace and facilitate talks. We will continue to play such a constructive role.